It just occured to me that the first gay heroine to headline a DC Comic won't be Batwoman. Oh yeah, right. Huh, how'd I miss that? I guess it's because they did their "a gay headline hero" thing in exactly the way they should: as a byproduct of an already existing storyline. Holly taking over the costume from Selina makes sense and has precedent, and that DC has happened to give a big title to a gay character is merely a lucky strike extra. On the other hand, I may not have thought of it because Selina Kyle is still the lead of Catwoman, in or out of costume. 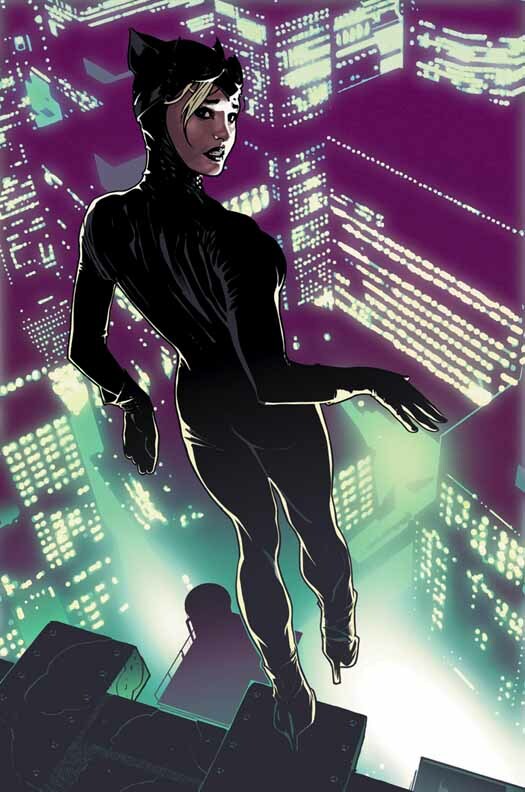 Holly may be in the catsuit for five more issues, or five more years, but Selina will still be the star. Oh, man, that sound you just heard was the impact of Captain Obvious colliding with Commander Dumbass. Having never bought this book (I know I should I've heard nothing but good things) this sort of feels like when Jim Rhodes took over for Tony Stark or Spidey's new costume. Will it last? Then again DC is more likely to keep people dead/retired than Marvel. Still, cool. Imagine that. The world didn't end and it's not corrupting the youth (well more than comics already corrupt youth). ...I don't know if it helps or hurts that the only stable, normal part of her life is her girlfriend Karon. I basically have only read the OYL Catwoman issues and maybe, like, 3 random issues from the past 5 years, and didn't know Holly *was* a lesbian until reading this post. "Yes, I worry for Holly, my protegée, who as well as being the new Catwoman, sleeps with girls!" "Sorry I'm late, I was in bed with my lover - who is another girl, just like me, who am also female! See, we're lesbians!" For dialogue like that you'll have to wait until Winick writes her.